It was my first day in Los Angeles and everything felt perfect. Then, nothing happened for six years. “I arrived in LA on a typical California day. The sun was shining, the sky was blue, the palm trees were swaying in the breeze. I pulled off the 101 Freeway and drove into Hollywood. It was my first day in Los Angeles and everything felt perfect. Then, nothing happened for six years. Well, some stuff happened…but six years is how long it took before I was finally earning a living as an actor. Six very long years. Six years of crying and accumulating debt and living in crappy apartments. Six years of small successes followed by heaps of rejection. And it would be two additional years before I landed the role of Pam Beesly on The Office. Eight years, then. Eight grueling years before I’d get my first big break. 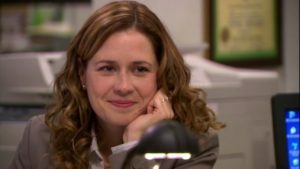 Jenna Fischer is an American actress, who scored bit roles on television shows like Spin City, What I Like About You, Cold Case and a recurring role on Six Feet Under, before landing her breakout role on NBC’s The Office. Fischer played the role of the witty office receptionist before her character advanced to become a saleswoman and, ultimately, the office administrator. The show ran for nine seasons, from 2005-2013. Fischer is also known for her starring role as Lena, on ABC’s Splitting Up Together, which premiered in 2018.